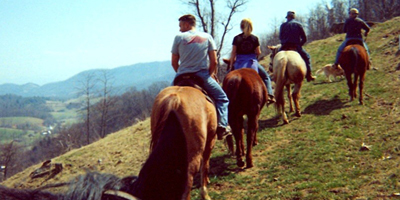 The Horse Back Riding Vacations NC at Randall Glen, a lovely mountain community located just a few minutes outside of Asheville in the NC Great Smoky Mtns., has been hailed as one of the Best Horseback Riding Vacations for the entire family. Not only can you and your loved ones explore miles and miles of horseback riding trails with professionals guiding the way, but the folks at Randall Glen are also known for serving up a delicious picnic lunch while you are on certain trail rides. Read more about these amazing, special lunch rides. In addition to the lunch rides, Randall Glen also features waterfall rides, farmland rides, and mountaintop rides that take you through the most gorgeous parts of Big Sandy Mush. Big Sandy Mush is completely surrounded by mountains and has been protected from the commercial development that has seemingly overtaking other parts of the nearby mountains. Not even a gas station is located here. When folks come to Randall Glen they often remark that Big Sandy Mush has not changed for more than one hundred years. Family Farm Vacations at Randall Glen are simply unforgettable. Learn more about the area activities that you and your family will discover at Randall Glen. There’s gem mining, caving, hiking, mountain biking, fishing, gardening and so much more all here. Get back to a simple way of living and enjoy a quiet and relaxing time with you and your loved ones. Check out our Asheville NC Luxury Cabins and start planning to enjoy one of the Best Horseback Riding Vacations with your family! It’s really possible, leave it up to us!